It's the season for pumpkin spice donuts at Dunkin Donuts. And the past few days has brought nothing but weeping, wailing and gnashing of teeth for me in this regard. I'm only slightly exaggerating. Me: Good morning, I'd like a dozen donuts, 6 of them pumpkin spice and 6 of them chocolate frosted. DD lady: Ohhhh....sorry...we don't have any pumpkin spice. And we only have one or two chocolate frosted. What else would you like instead? Me: Nothing. I came specifically for those two things. I'll have to come back another time. DD lady: Okay, I'm so sorry m'am. The first day I went they had no pumpkin spice and one or two chocolate frosted and the second time they had absolutely none of either. I resisted the urge to say: "Do you guys even have the equipment turned on? Did anybody wake up in time to make the donuts? The guy on the commercial always woke up at the crack of dawn and said, "time to make the donuts" but he's obviously left the building or no longer works here..."
But I said none of these thoughts that were in my head, which was a blessing for them. I just got really irritated. The second time, I was so mad, I slapped my hand on the steering wheel and Savanna said, "Mom, calm down, we're talking about donuts here. No need to have a meltdown." Am I the only one that takes donuts and coffee seriously? Sometimes it can seem like a worthy steering-wheel slapping matter, particularly when you've been waiting for pumpkin spice all freakin' year. And soon they're going to go away for another whole year. Another. Whole. Year. 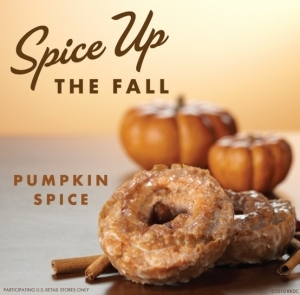 We're going to be left with fantasies of pumpkin spice dancing in our heads. We will languish in wait until we see the announcement that they are back. I hate it when my kids correct me and they're right. It happens more than I'd like. "Am I getting nobler, better, more helpful, more humble, as I get older? Am I exhibiting the life that men take knowledge of as having been with Jesus, or am I getting more self-assertive, more deliberately determined to have my own way? It is a great thing to tell yourself the truth." I still get way too mad when I don't get my own way. What about you?